Responsible disclosure: retrieving a user's private Facebook friends. Data access control isn’t easy. While it can sound quite simple (just give access to the authorized entities), it is very difficult, both on a theoretical side (who is an authorized entity? What does authorized mean? And how do we identify an entity?) and on a pratical side. On the pratical side, how we will see, disclose of private data is often a unwanted side effect of an useful feature. Facebook bought Instagram back in 2012. Since then, a lot of integrations have been implemented between them: among the others, when you suscribe to Instagram, it will suggest you who to follow based on your Facebook friends. Your Instagram and Facebook accounts are then somehow linked: it happens both if you sign up to Instagram using your Facebook account (doh! ), but also if you sign up to Instagram creating a new account but using the same email you use in your Facebook account (there are also other way Instagram links your new account with an existing Facebook account, but they are not of our interest here). Back in topic: Instagram used to enable all its feature to new users, before they have confirmed their email address. This was to do not “interrupt” usage of the website / app, they would have been time to confirm the email later in their usage. Email address confirmation is useful to confirm you are signing up using your own email address, and not one of someone else. One of the features available before confirming the email address, was the suggestion of who to follow based on the Facebook friends of the account Instagram automatically linked. This made super easy to retrieve the Facebook’s friend list of anyone who doesn’t have an Instagram account, and since there are more than 2 billions Facebook accounts but just 800 millions Instagram accounts, it means that at least 1 billion and half accounts were vulnerable. 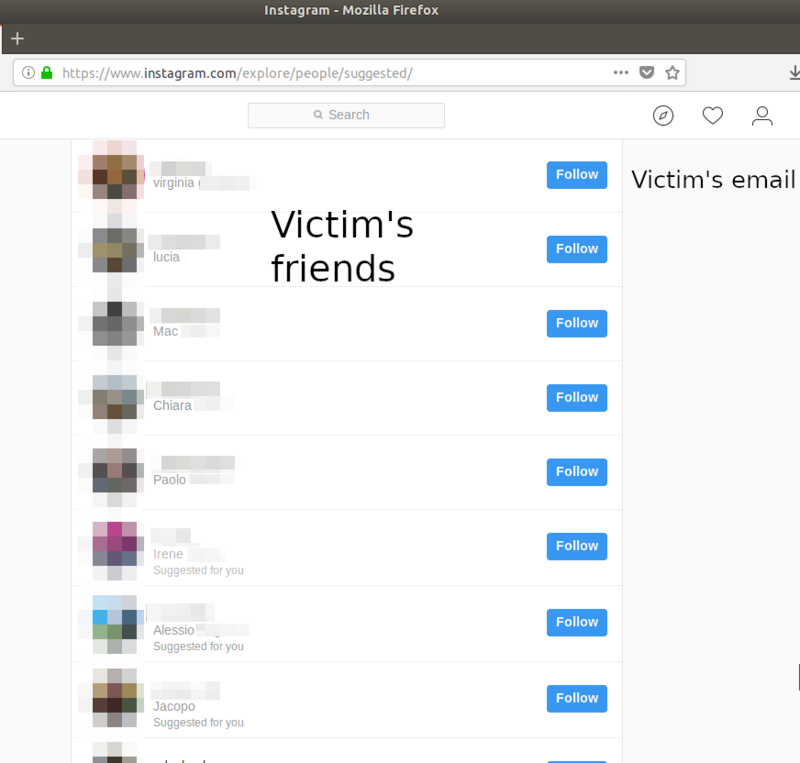 The method was simple: knowing the email address of the target (and an email address is all but secret), the attacker had just to sign up to Instagram with that email, and then go to the suggestions of people to follow to see victim’s friends. The combination of two useful features (suggestion of people to follow based on a linked Facebook account, being able to use the new Instagram account immediately) made this data leak possible. It wasn’t important if the attacker was a Facebook’s friend with the victim, or the privacy settings of the victim’s account on Facebook. Heck, the attacker didn’t need a Facebook account at all! Facebook awarded me a $3000 bounty award for the disclosure. This was the first time I was awarded for a security disclosure for Facebook, I am quite happy with the result and I applaude Facebook for making all the process really straightforward. For any comment, feedback, critic, write me on Twitter (@rpadovani93) or drop an email at riccardo@rpadovani.com.